Of course that doesn’t mean they’ll be made public. It is just sent back to the Department to make a decision whether records (which they claimed didn’t exist) are exempt from Freedom of Information or not. And if say they did decide they were exempt – then it’s back into the appeals process. How long then for another decision? As I’ve said many times before, poor practice by public bodies in dealing with FOI requests is effectively being rewarded by this unacceptably slow process. 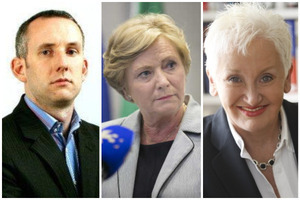 An email – as seen at the recent Disclosures Tribunal – containing press clippings sent from Terry Prone, of the Communications Clinic to both the then Minister for Justice Frances Fitzgerald and former Garda Commissioner Nóirín O’Sullivan in 2014. Posted in Misc and tagged Ken Foxe, Terry Prone at 3:10 pm on July 31, 2018 by Bodger. I dream of a day where we never have to talk about this again. 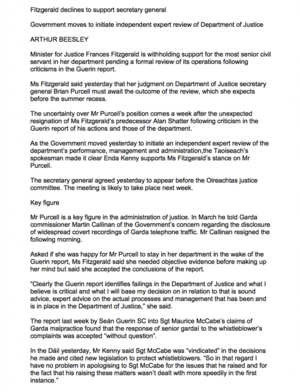 An email – as seen at the recent Disclosures Tribunal – containing press clippings sent from Terry Prone, of the Communications Clinic to both the then Minister for Justice Terry Prone and former Garda Commissioner Nóirín O’Sullivan in 2014.
any trails on replies from the Minister etc to and from within that email string? or has that already been done? 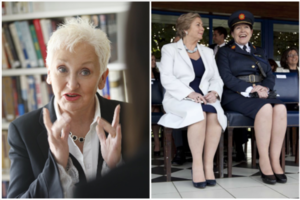 How is it that Nóirín’s email address is made public but Frances’ and one of Terry’s are withheld? 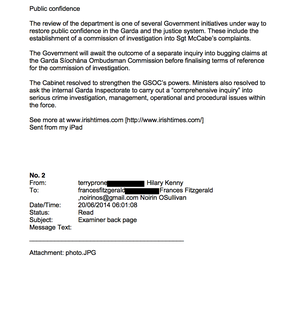 I see that the Guards ALSO didn’t find any emails to/from Terry Prone in this FOI (page 2, 1/2 way down https://www.garda.ie/en/Information-Centre/Freedom-of-Information/Decision-Log/Finance-%E2%80%93-General/FOI-000098-2017-Decision.pdf). 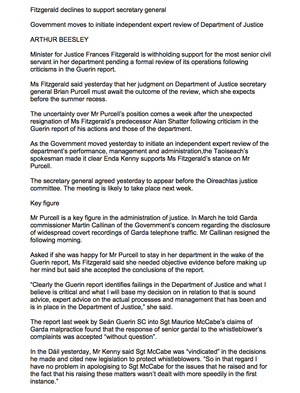 And yet there it is to Noirin’s gmail in 14/05/2014. That’s pretty lousy detection for a police force. I hope you were reimbursed your €30. A reasonable person could be forgiven for thinking that they actually don’t want to disclose this information. I don’t want to sound too harsh but Terry Prone seems like a real nasty piece of work. 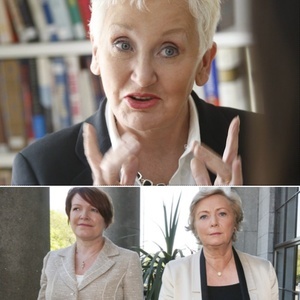 She was on the Tonight Show last week boasting about her role in getting a 2nd Lisbon Treaty referendum here. Is little wonder why Leo was so keen to get the strategic communications unit up and running quickly and quietly. With it, they could sidestep all of those pesky privacy/communications ethics laws in private. Even the divil himself wouldn’t take her. As Nana meadowlark likes to say. Did you mean Nana Murderlark?